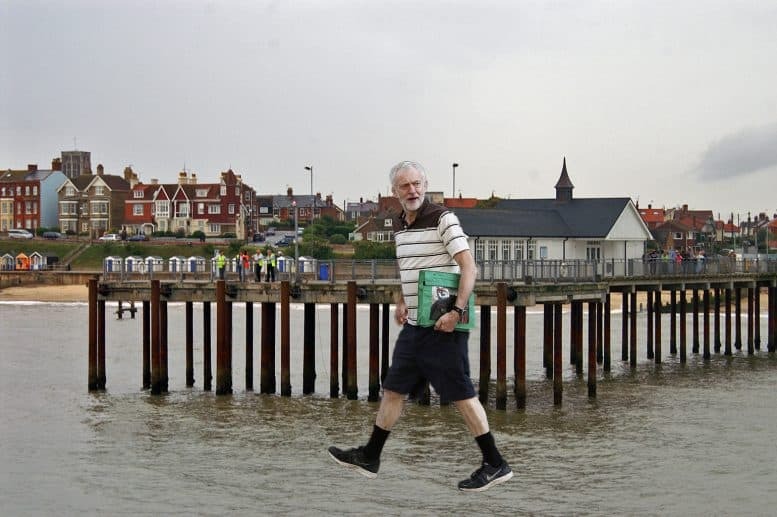 Jeremy Corbyn walked on water a mile out to sea off Southwold Pier before the Labour Party Conference, we can exclusively reveal. Mr Corbyn – or JC as he is nicknamed by his followers – turned up for the Suffolk rally to show the posh townsfolk his leadership skills before he headed off to Liverpool where he swept to victory as Labour leader. “It was a miracle,” said Colonel “Sandy” Sanders, who normally votes Conservative. “We knew Jeremy had this holier-than-thou attitude but he has proved it’s not just an image. “He walked a mile out to sea, turned round, shook the water off his robes then did some more tricks on the pier. He turned some Perrier into wine, a nice Merlot as it happened, raised a dead drunk, and calmed a storm heading along the coast. “Then he went to a little bistro and turned a few focaccia loaves and a couple of sea bass into a slap-up meal to feed the multitude who had turned up to see him. “While he was on the pier his entourage had a fun stroll around the Wacky Walk of Mirrors. It was hilarious. Everyone looked like something they weren’t really, with stupid grins and funny looks. They explained how the Sizewell plant is going to be turned into Britain’s biggest yoga class and the Southwold beach huts will be turned into council housing. Meanwhile, in a clever bid to make himself more popular, Mr Corbyn has invited photographers inside his Islington home for a photo shoot for next month’s Halo! magazine.